Mission is the spirit of the early Church. What drives men and women to bring the Gospel of Christ to the world? It is the prompting of the Holy Spirit who moves us suddenly and unexpectedly with sufficient grace and power to make real the hope and faith that He has placed in our lives. Father Stephen Georgeson Hatherley was such a man with a mission. He was an Englishman who converted to Orthodoxy in the late 19th century when it was difficult to do so. Such a move invited scorn and persecution from the prevailing intolerance of the establishment. He was ordained priest in Constantinople in about 1870 and was given the name of Timothy. Having been ordained a priest of the Ecumenical Partriarchate of Constantinople, he gathered around himself a group of English converts, opening a small church in my home town of Wolverhampton (now a City) in the industrial Midlands in 1873. It was one of the first Orthodox Churches (apart from Embassy Chapels) since the time of the Great Schism. The Orthodox Church in Wolverhampton was on the Waterloo Road near to the Molineux Football Ground of Wolverhampton Wanderers. 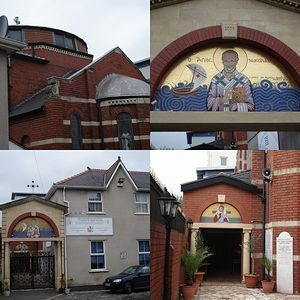 The Church was closed and Fr Stephen ended his days ministering to the community of Greek merchant sailors in Cardiff upon which mission followed the building of the permanent church of St Nicholas of Myra in 1905. On every occasion that I pass the place where the Church was in Wolverhampton I make the sign of the cross and pray for the memory of Fr. Stephen - in his own way a pioneer and even a martyr to the mission of Orthodoxy. I am proud that it was my home town where the return to Orthodoxy began in England and it was God's providence that a fellow convert sowed the seed which was to grow in the heart of another one hundred years later. The Church is not the building but the people of God, Fr. Stephen's (Timothy's) brief ministry was not without effect. Article published in English on: 22-9-2011.